Drinks editor Sam Wylie-Harris shares her top tips for serving cocktails at home in style. We're in the midst of a cocktail renaissance, when every bar worth its salt - a pinch of Maldon can nicely temper sweetness and highlight freshness, by the way. Likewise, if a drink is too sweet - add lime or bitters; too tart - add sugar syrup; too strong - add a few drops of water to a stirred drink, and if it's a shaken cocktail, pour it back into the shaker and shake again with fresh ice. But I digress. Back to the original point: Whether you're perched on a plush velvet bar stool or something more urban, chances are, the bartender has curated a well thought-out drinks list, with some new takes on the classics and a few modern twists to showcase the intrinsic beauty of a well-crafted cocktail - but what if you want to be the one fixing the drinks and calling the shots? While cocktails are synonymous with the high life, there isn't actually any secret or mystique to creating a beautifully balanced drink - you just need a few tools of the trade, and a suitably stylish setting always helps. A drinks trolley always makes a great showpiece. It's where you want to place your prized stemware (we'll come to that later), crystal decanter (could be a family heirloom), ice bucket, tongs, and other bits and bobs. They can be pricey, but they certainly make a great investment piece if you can afford the outlay. Otherwise, charity shops are good hunting ground for vintage tea trolleys, which can be painted piano black or glossy white to look the part. 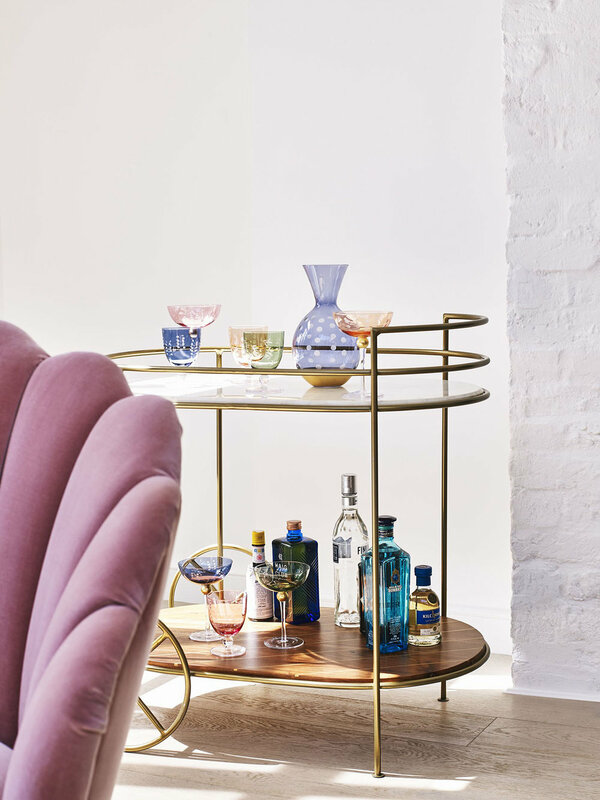 A cocktail tray on a sideboard always looks attractive too, and the high street currently has some great options. The bar essentials for making cocktails are a jigger (dual spirit measuring cup), Boston shaker (two separate cups which form a tight seal, so there's no spillage when you shake), mixing glass (if you prefer your martini stirred and not shaken), strainer (to hold back any herbs, fruit or ice when you strain the drink), long bar spoon, sharp knife and a citrus juicer. Some of us would happily drink from anything, from a trendy jam jar to a candy-coloured crystal coupe, but ideally you should have at least four styles of stemware (nothing wrong with cheating and doubling up with a similar type of glass for various cocktails). And they should look as glamorous and exciting as possible - within budget - bearing in mind you need to be prepared for breakages. For short, mixed drinks on the rocks, you'll need an old fashioned or tumbler. A high ball for long, mixed drinks. Short drinks which are shaken, strained and served without ice should be poured into a martini glass or coupe (good for cocktails with egg whites). Champagne or wine cocktails should be served in a flute or a large wine glass. This is the fun bit, when you can really tailor your taste (and tray or trolley) with reasonable quality spirits, good-looking labels (we all love to drink with our eyes) and limited editions, such as ornamental cages which can be used as a fruit bowl when the bottle is removed. For your building block to make the classics, you'll need a bottle of vodka, gin, white and dark rum, tequila, whisky, rye whisky, brandy and Campari. Then you'll need the most commonly used liqueurs, such as orange liqueur (Cointreau is an obvious choice) and sweet and dry Italian vermouths. For cocktails such as a daiquiri, which call for sugar syrup, you'll need a bottle of Monin Pure Cane Syrup. For a Manhattan, Angostura Bitters and to salt the rim of a margarita, Maldon sea salt. The golden cocktail rule is all citrus juice must be freshly squeezed, hence the juicer in your tools list. Garnish is the cherry on the cake. Think of the meticulous care professional bartenders put into garnishing a cocktail. Not only does it make a drink look instantly more appealing, it smells good too and can be tweaked to complement or create a contrasting flavour profile. Whether it's a lemon, lime or orange, you'll need a sharp knife to cut a long, thin strip of peel to twist into a curly shape. Note: As with any recipe, using the best quality spirits, freshest fruit, premium mixers and good quality (large) ice cubes will always give you the best results.... Chin-chin!